Here’s a glimpse of what I completed over the weekend. On the left, my birdie blouse. 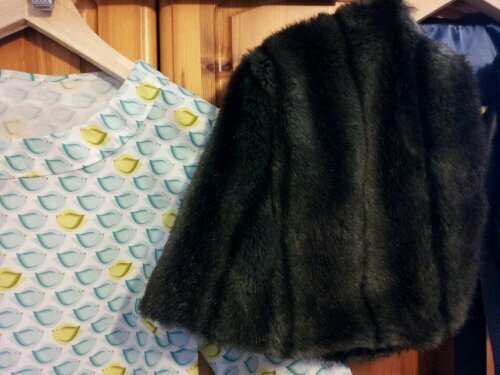 On the right, the fur cape complete with satin ties and velvet trim at the neckline. 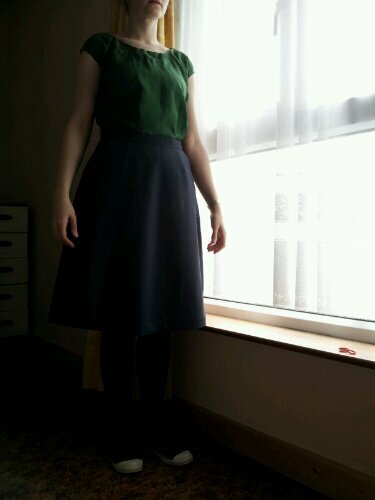 The current work in progress… My third ‘Ginger’ skirt. I bought a mere 75 cm of thickly woven wool and was delighted to find I’d squeeze one out of it. The weave, hand, colours and heft delight me. All that remains is to attach the lining. I’m clearly stalling on the jacket because I have to trace the pattern! I think I’ll bite the bullet tomorrow. 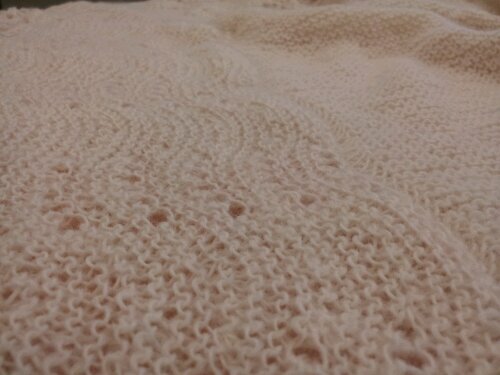 This is a top I finished well before Christmas but I’m not happy with it. Pattern: Portrait Blouse from ‘Gertie’s book for better sewing’. Fabric: About 1m of silk. I got it on sale from Rubanesque, I paid about a tenner for it. So, what’s the problem? It fits great and was very easy to put together. Two problems: the facing wouldn’t lie flat. I tacked it down but it doesn’t look good. In hindsight, I should have used a super-light interfacing. The other problem is the hem on the sleeve caps. I followed the instructions but really, I should have hemmed them with my little rolled hem foot before I joined the front to the back. It tucks in really nicely and I have to say, it’s a really comfortable, versatile top. 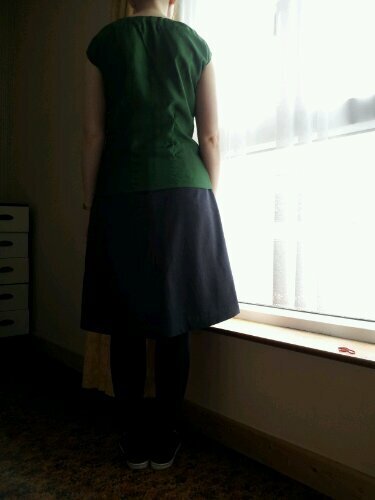 It would look nice with a cardigan and jeans or with a skirt and jacket. Looking at these photos, I think I should give it another go. As for the book, it’s a keeper but not for a beginner. The patterns are stunning. If you’re a fan of Gertie’s blog, you’ll like the book. It was one of those weekends that wasn’t a weekend. 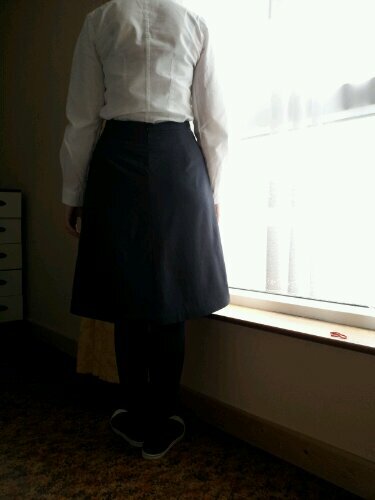 I had to go to a funeral in Kerry so I got a lift down Friday night after work with another girl who was also going. We drove back Saturday and then I worked Sunday morning. Back to school today so feeling a bit weary! Anyway, I have this great new skirt to wear. Pattern: The skirt part of Sewaholic’s ‘Cambie’ dress. I don’t work in such a formal environment that warrants a dress like this so I figured I’d get more wear out of the skirt part. Fabric: About 1m of charcoal wool suiting from Murphy Sheehy’s, about €15. Lining is that lovely teal peacock feather one I showed before, think it was about €7/m. So total cost about €25 including the zip. What I love about it is the shape and the slash pockets. They lie perfectly flat but are still functional. The pieces fit together perfectly and it was very, very easy to make. If you’re interested in doing the same thing with this pattern, just omit the bodice part – even the waist band is included. Even though it turned out well and it fits nicely, it’s still not fantastic. Two things are not so good. 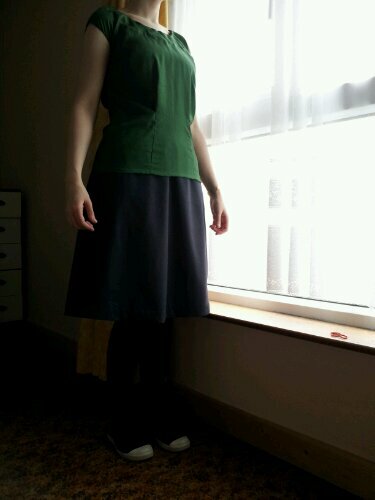 Firstly, I decided to make bias binding to finish the hem using the Colette method from the book. It works amazingly well! 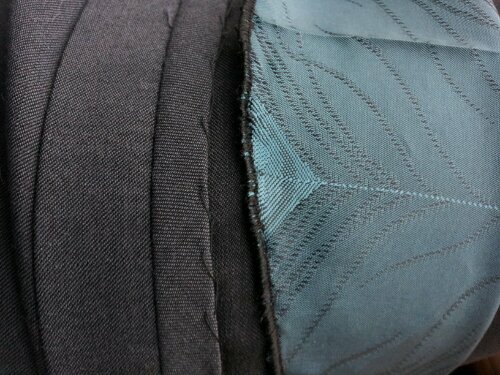 But I made the binding too narrow which made it difficult to attach and finish. It’s ok but it could be better. 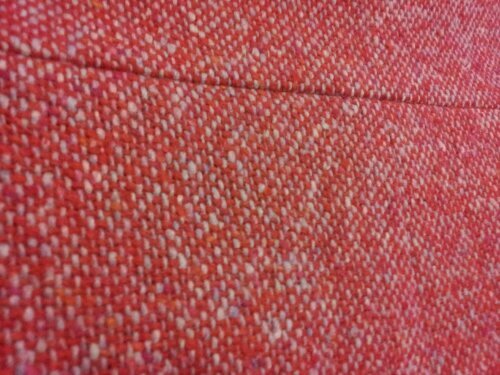 Secondly, I used my serger to put a rolled hem on my lining. Despite much experimentation, the finish is not very good. 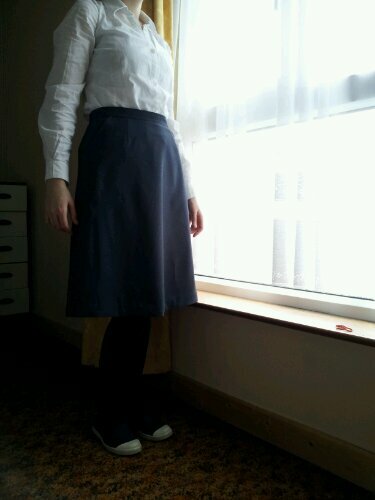 Upon reflection, I think the lining is just that bit too heavy for a rolled hem and a normal narrow hem would have sufficed. 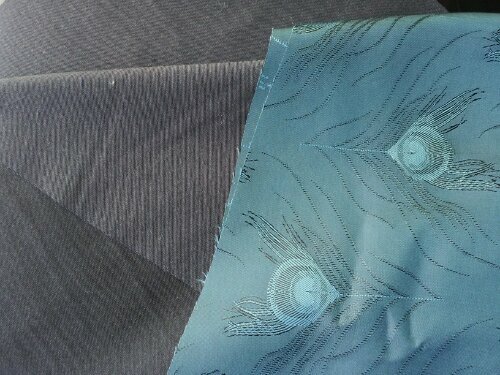 I also marked the hem for serging completely arseways so it is short and wobbly. These are not make-or-break problems, rather things that I can improve on next time. I’ve picked my jacket pattern and hope to have a little free time to trace it and make a muslin this week. Already dreaming of mid term! Literally. Still battling a cold which so far had only manifested itself in an intense desire to sleep 15+ hours a day, a runny nose and an occasional cough. 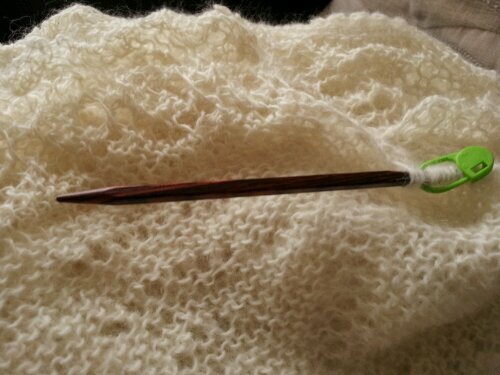 Perfect conditions for knitting on my cloud. I was digging around in my stash yesterday and I found remnants from my wedding shawl, enough to finish the edging, so on I went. I am about half way. Excited to think I have enough if this lining for both my skirt and jacket. 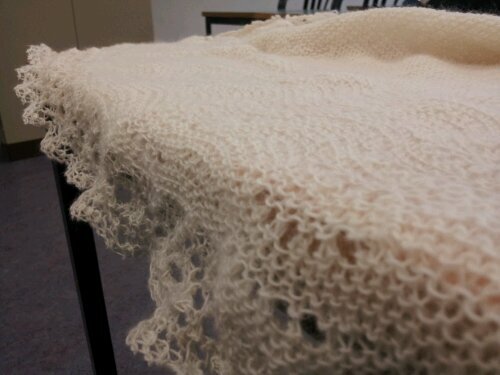 Knitting endlessly on what I have started referring to as my ‘cloud’. Despite starting out with a generous two skeins of Malabrigo Lace, I have run out not even halfway through the knitted on edging.